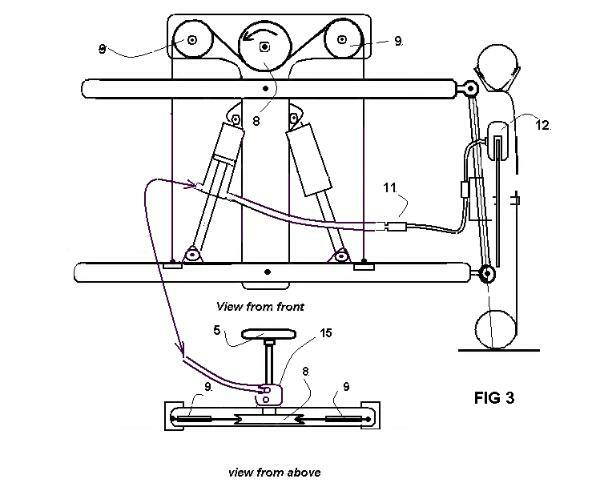 Tilting Vehicle Australia wishes to disclose inventions that relate to tilting vehicles. 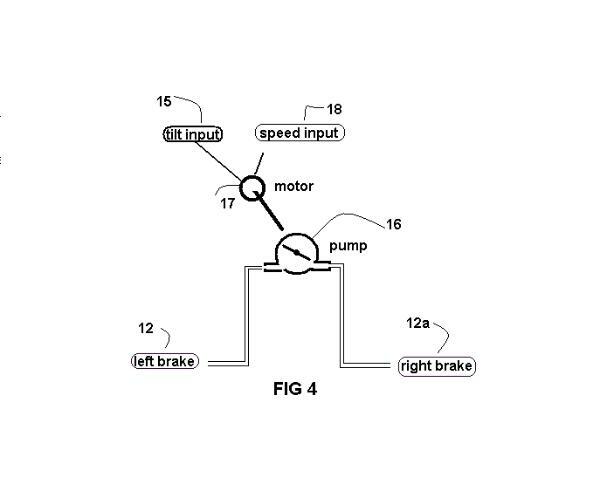 Invention:  " AUTOMATIC COUNTERSTEER BOOST FOR TILTING VEHICLE"
Date of invention February 2003. Inventor Phillip James. 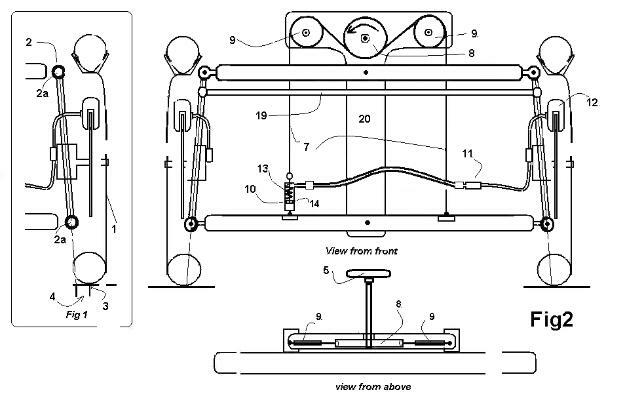 Invention  " WHEEL ARRANGEMENTS FOR TILTING VEHICLE"
Date of invention February 23, 2008 Inventors: Bokhorst, Davenport, James. 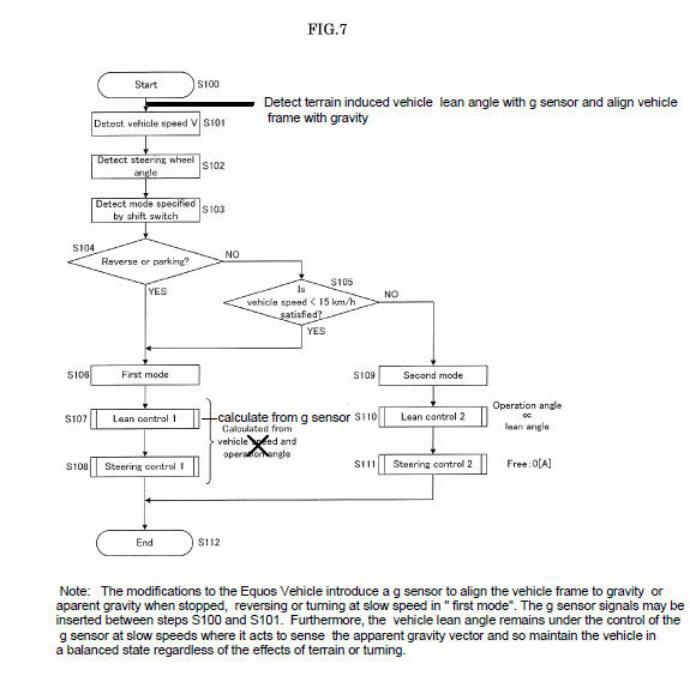 Invention  " TILTING VEHICLE TERRAIN COMPENSATION"
The inventions to be disclosed are disclosed on this page. Please scroll down to view all items. 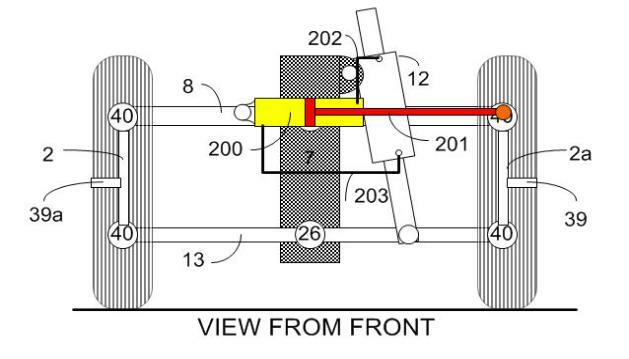 This invention applies to wheeled vehicles that tilt into corners . * Countersteer is a tilt force method for tilting vehicles. * The control element is generally a handlebar . driver and the vehicle. The control becomes a simple steer style input. 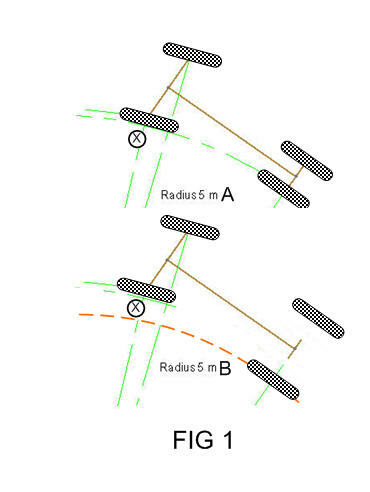 because its tilt position is fixed arbitrarily normal to the road surface or in fact tilted the wrong way in a corner . automatically actively optimise its tilt position suitable for the curved path and speed of the vehicle. tyres and the road as is the case for countersteer tilt control. conditions that can allow a narrow vehicle track suitable for urban transport. SUMMARY OF THE INVENTION and PRIOR ART. force to countersteer steerable wheels. c of g to the inside of the vehicle centerline as the vehicle travels on the drivers required curved path. desired. Brake steer systems will be described later. vehicle systems is in no way limited by these specific references. steer and in this example it is the " steer means" for the vehicle to follow the drivers directed path. benefit is the ability to apply torque control remotely and effectively to the steerable wheels. It is a convenient arrangement that can utilise existing components. about its steer axis. As the two front wheels are steerably connected by track rod  both are steered. The application of brake countersteer to a tilting vehicle will always have specific system requirements. 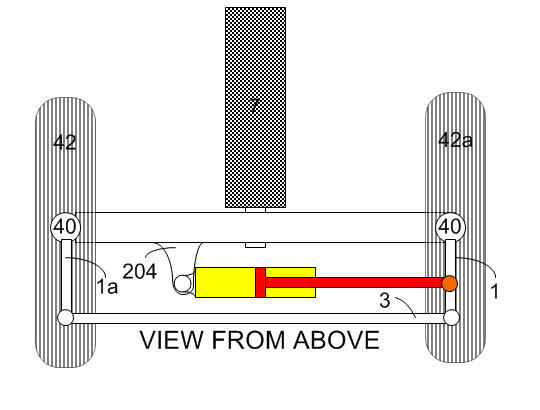 Fig 2 shows a manual tilt system applied to a vehicle of type WO2005/075278. applied to the front of the vehicle and these are also well known. WO2005/075278. Various connection designs can be used between driver input and vehicle tilt action. becomes the "brake controlling elements". brake caliper [12 ][again one side only is shown]. The caliper and disc are the " front wheel brake elements". together whenever one or the other is braked. 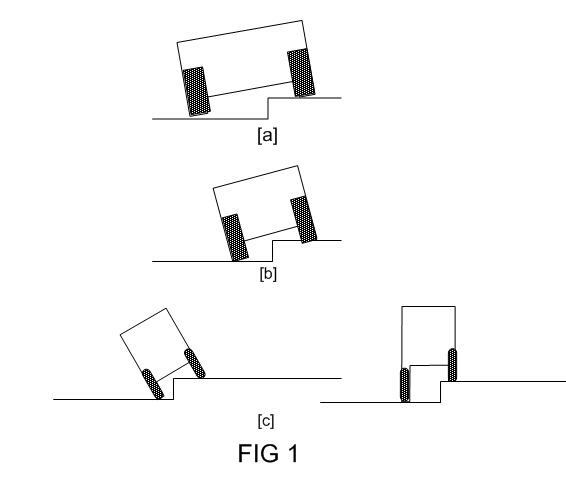 attempts to tilt the vehicle [the tilt mass inertia], the system operates with automatic closed loop feedback . characteristic of a tilted castoring wheel as has been described in prior art. This is the "vehicle steer means". produce a tilt assisting countersteer of the vehicle. control signals or other methods. using solenoids or similar means. The indicator of vehicle tilting action may take various forms. free to caster[ FTC] tilting vehicles. free to caster tilting vehicles. the steerable wheel/s are ultimately released at aprox 16kph to become FTC. as the drivers control is " by wire"
simultaneously reconnected to the vehicle tilt position. becomes uncomfortably unstable for its occupants. where it can be seen that the vehicle frame remains normal to gravity. path at slow speeds when travelling forward or in reverse. speed and wheel steer angle. stable and comfortable platform for the occupants under all potential operating conditions.including reversing. the general prior art of dynamic platform stabilization. vehicle tilting frame to a " by wire" connection with the vehicle steerable wheel/s as speeds drop[ and vice versa]. The methods are progressive and automatic by computation. sensor/ accelerometer can be integrated in various ways with the other sensors used in the Equos vehicle. diminishes or reduces to zero. Phillip James, Tilting vehicle Australia . 20th January, 2018.